In theory breakfast is my favourite meal of the day. I love breakfast food of all kinds – Israeli, German, Indian, American and the great Australian Cafe brekkie are all good as far as I’m concerned. I was brought up to believe breakfast was the most important meal of the day, but my childhood family breakfasts were rather ramshackle affairs, and never really lived up to this ideal. I have a small family of three and we are pretty dysfunctional when it comes to breakfast. Sure we can get together for a big weekend breakfast/brunch but we can never all decide on a family weekday breakfast that satisfies us all. We are also very flighty and changeable when it comes to our favorite breakfast food. My son has never been much of a breakfast person and now he’s a teenager it’s a challenge to get him to eat anything at all before school. I’ve given up the fight and now I’m overjoyed if he eats some Nutragrain and milk. I know, it’s unhealthy and full of sugar, but at least it’s breakfast and it makes me feel like slightly less of a failure as a parent. I admire people who can eat the same breakfast everyday of their lives, but I am not that person. For over a year my favourite breakfast was Steve Richardson’s untoasted magic muesli from Melbourne. Because magic muesli is not available in Sydney, I would order it online and, because I hate paying for postage, I would order three kilos of muesli and pay the same price as I would pay at the Melbourne markets. This would be fine, except I am the only person in my house who eats untoasted muesli, so I would have to eat three kilos of muesli by myself. This is possible but requires a steadfast commitment to eating the same breakfast almost every day for months. While I was eating my magic muesli my husband who is a crunchy granola/ toasted muesli breakfast person, would buy substandard packets of over sweetened granola from the supermarket and our pantry seemed to be full of opened, half eaten packets of granola, which I would always end up throwing out. Which brings me to this savoury muesli from Alison Roman. While this muesli hasn’t converted my son to eating breakfast, it has meant my husband and I are now eating from the same muesli jar. This savory muesli has a slight, sweetness and spiciness to it that is surprisingly good first thing in the morning. Alison Roman chops up cucumber and tomatoes, tops them with yoghurt and granola for a fully savoury breakfast but I just go with the fruit, yogurt and granola topping for salty, sweet, sour combination. 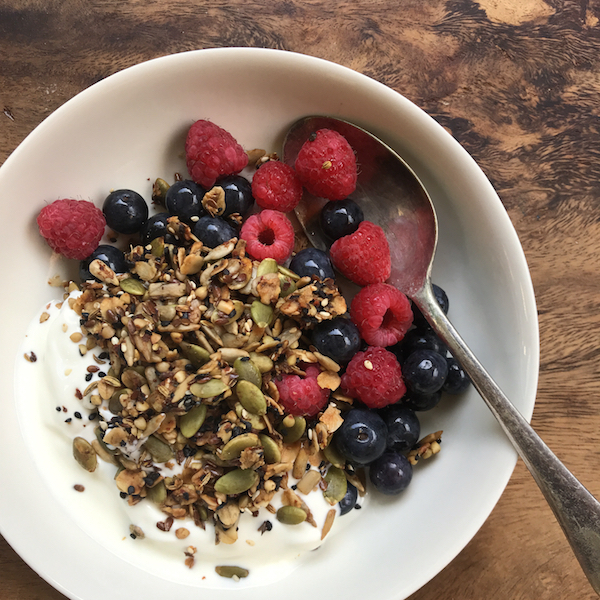 As the mornings are getting cooler and porridge may make a comeback this granola could work well as a topping to savoury porridge. Note – This recipe calls for three egg whites which you could omit but they do make this granola super crunchy and you can use up the spare egg yolks by making this simple 3 egg yolk custard. I haven’t made custard for years, I remembered it as something tricky and prone to curdling, but a couple of teaspoons of cornflour makes it almost fail proof. I’d forgotten how good homemade custard is, there’s very little added sugar and this allows the natural sweetness of the milk to shine. Since I’ve discovered eggs whites make baked stuff crunchier I’ve used them to coat and bake cauliflower (this also works with baked sweet potato wedges) It’s good to have another use for spare egg whites that isn’t pavlova or some other sweet meringue. Preheat oven to 160C (325F) and line a rimmed baking sheet with baking paper. In a large bowl mix together all the dry ingredients – oats, sunflower seeds, pumpkin seeds, buckwheat groats, linseed, sesame seeds, nigella seeds, Aleppo pepper, salt and season with lots of black pepper. On a small bowl mix together oil, maple syrup, egg whites and soy sauce and mix through oat and seed mixture until evenly coated. Spread mixture in baking sheet . Bake for 45 to 55 minutes, stirring every 15 minutes until golden brown and toasty. Cool completely, break large clumps into smaller pieces. Store in a glass jar or airtight container. Keeps for at least a month.